First Methodist Prayer Chain - Anyone needing prayer is encouraged to contact the church and request prayer. They may give as much or as little information as they choose to share. This request goes out to those people who have asked to pray for others. Sincere prayers are offered up to God on behalf of those who are in need. If requesting prayer for others you must obtain permission from them for their names to be mentioned. We will not share prayer information without consent from those who are in need. For this prayer ministry please call the church office at 830-672-8521. Through a beautiful friendship, First UMC Gonzales is partnered with Missionaries, Spencer and Kendra Thomas, who serve in San Jose, Costa Rica. We went on our first group mission trip to Costa Rica in July 2018, and plan to continue serving in this capacity every other year. First UMC is committed to partnering with Matt and Sarah Rideout and their family, who serve as resident missionaries in Haiti. For more information on how to be involved in this partnership, please contact the church office. 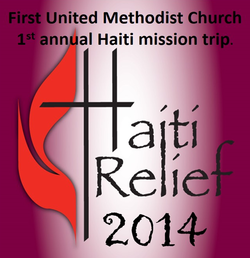 The first trip First UMC took to Haiti was in 2014, and we continue to actively support God's work in Haiti today.